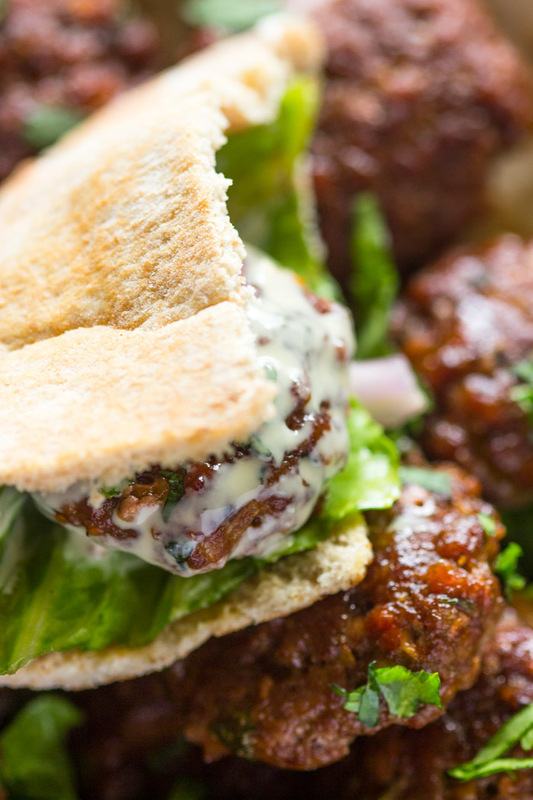 Quick and easy to make kofta patties are juicy and tender and full of flavor. They work great in sandwiches, salads, or in rice bowls. 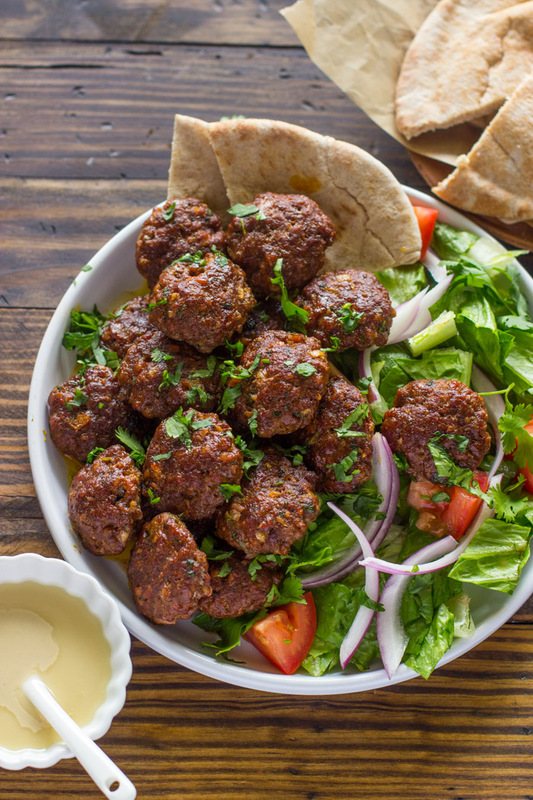 Kofta is a staple in Middle Eastern households. It’s just like a burger, except a little healthier and a much more flavorful. 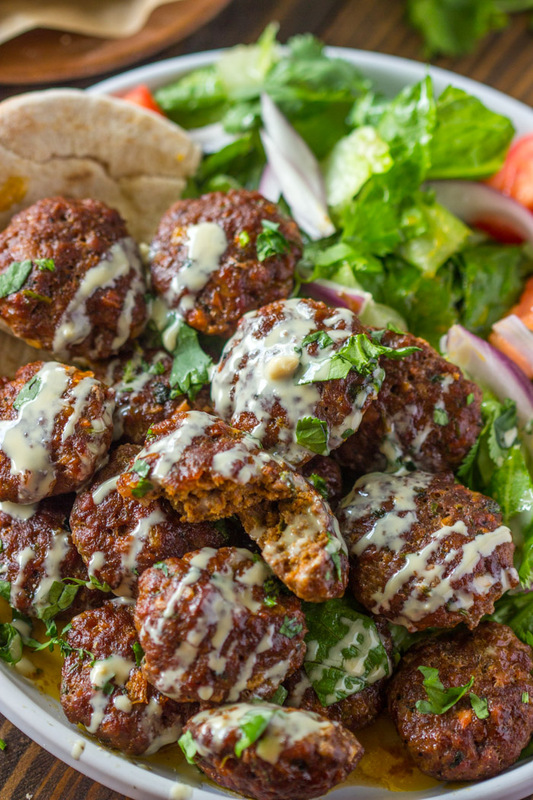 Kofta is packed with herbs and spices and baked, pan seared, or grilled to perfection. These kofta patties are no different. They are packed with delicious herbs and spices and because of their compact form, they work great in sandwiches, on salads or rice bowls. They are also pretty easy to double or triple if you’re feeding a crowd. They can be prepared the night before and refrigerated for up to 2 days before cooking or even frozen for weeks. When needed, just pop a few patties out and bake or pan sear them. 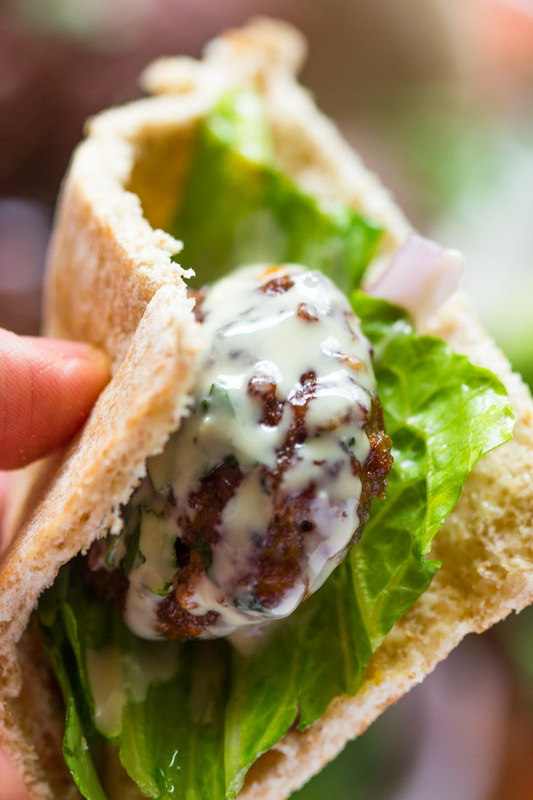 To finish of these yummy kofta patties, top them with tahini sauce (a sesame seed paste), shawarma white sauce, or your favorite sauce. Wrap a few patties in a pita along with some lettuce, tomato. 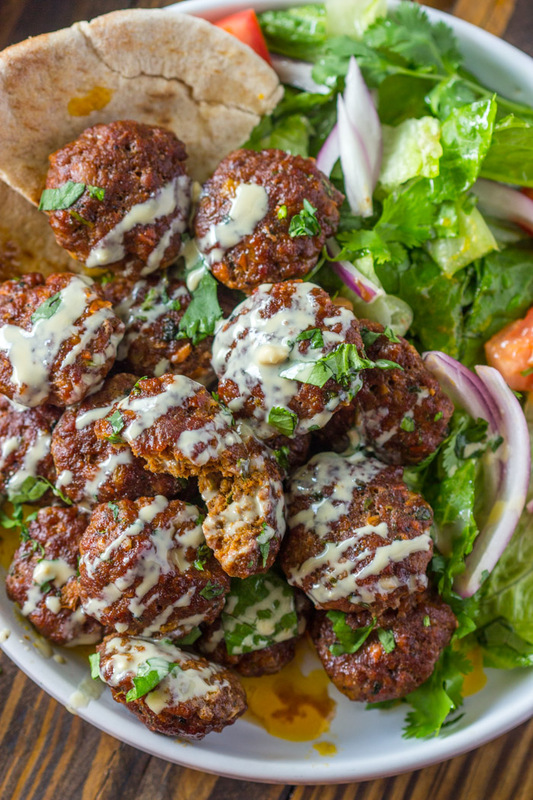 If you’re on a low-carb diet, simply cut up a salad and top the salad with the kofta patties and drizzle with tahini sauce or shawarma sauce! Tahini sauce is a sesame seed paste that can be found in your local Middle-Eastern supermarket or here. <span></span>In a large bowl, combine all the ingredients (except the tahini sauce) with your hands or a wooden spoon, until well blended. Form the mixture into 24 small ball; I like to use an ice-cream scoop to get the exact sizes. 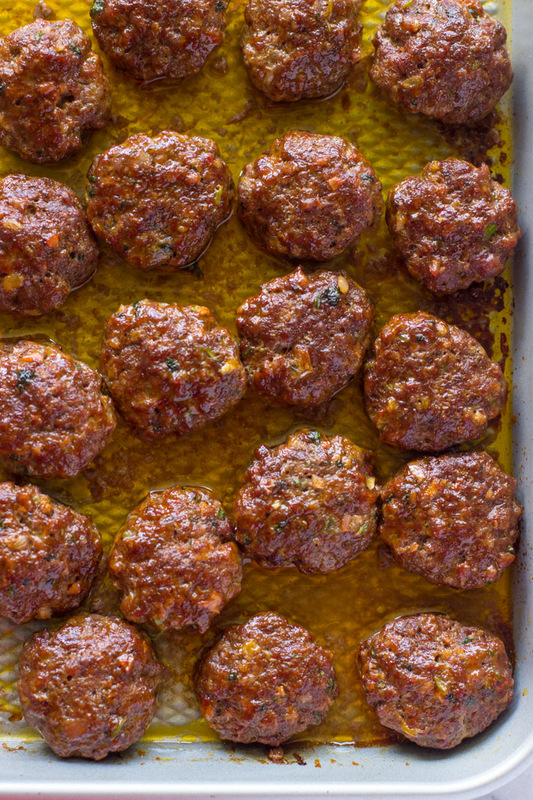 Place kofta balls 1 inch apart on an un-greased sheet pan and press to flatten; squeeze as many as you can on the pan because they will shrink as they bake. Bake for 12-15 minutes or until the center is done. Place under the broiler for 2 minutes or until lightly charred. Serve with lettuce, tomatoes, onions, and tahini sauce, in pitas or as a salad. Enjoy! Sorry this is an edit. 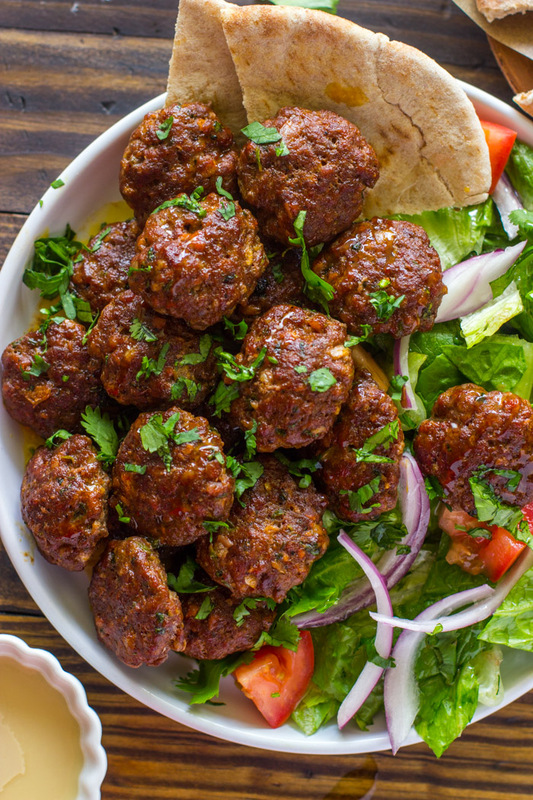 I MADE THESE TONIGHT AS KOFTA MEATBALLS AND THEY CAME OUT GREAT! I USED PARCHMENT FOR EASY CLEAN UP AND TRANSFERRED THE koftA TO A CLEAN baking sheet BEFORE BROILING. I BAKED THEM ON THE TOP RACK FOR 25 MINUTES AND BROILED FOR 8 MINUTES AND THEY WERE PERFECT. I ALSO MIXED THE INGREDIENTS IN THE FOOD PROCESSOR AND ADDED SOME FRENCH BREAD SOAKED IN MILK AND TWO EGGS to SMOOTH IT OUT. THE MIXTURE COMES OUT REALLY WET BUT IT bakes NICE AND MEATY AND MOIST! I SERVED THEM OVER RICE PILAF With A SIDE OF BRUSSEL SPROUTS. I made these tonight as kofta meatballs and they came out great! I used parchment for easy clean up and transferred the jota to a clean pan before broiling. I baked them on the top rack for 25 minutes and broiled for 8 minutes and they were perfect. I also mixed the ingredients in the food processor and added some french bread soaked in milk and two eggs TO smooth it out. The mixture COMES out really wet but it makes nice and meaty and moist! Good catch, Jessica! I’ve gone ahead and updated the post. Hello, I notice that there is oil on the tray, yet you mention un-greased pan, what is the oil thats floating underneath, also wont the kota be dry if you dont grease it with olive oil? That oil is the natural fat that comes out of the beef while it’s cooking, which is why I said not to grease the pan. These came out fantastic!! And SO easy! Hello, I am looking for the recipes for the shawarma white sauce and cannot find it. I only see the pictures but no actual recipes. What am I doing wrong? We were having an issue yesterday with the recipes showing up but they are back up now. Please reload the page and try again or clear your browser cache it is still not showing up. 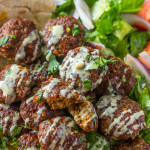 can you please tell me what’s in tahini sauce that’s used on baked kafta. It’s tahini, lemon and a few tablespoons of water. You can also just drizzle tahini as is. I made these tonight for dinner. They were amazing! And so quick to throw together. Thanks for sharing your recipe. ??? ?